On Sept. 6, 2017, the U.S. Air Force announced that one of its aircraft had crashed the previous day in the Nevada Test and Training Range, roughly 100 miles north of Las Vegas. Just a day earlier, two A-10s crashed during a training mission over the same range. Both A-10 pilots ejected safely, but the pilot of the aircraft that crashed on Sept. 5 was less lucky. Lt. Col. Eric ‘Doc’ Schulz died in the accident. In 2008, Schultz graduated from the Air Force’s elite Test Pilot School in 2008. Three years later, he became the 28th pilot to fly the F-35 stealth fighter. The Air Force wouldn’t specify the type of aircraft Schulz flew – only stating that it was owned by Air Force Material Command. There’s evidence the aircraft in question was either a foreign-built fighter jet or a highly-classified test article. Some well-informed observers believe it was a foreign fighter. Indeed, there are rumors that Schulz served as commander of the secretive Red Hats Squadron — a unit that tests the warplanes of potential enemies of the United States. None of this is confirmed, but there are good reasons to believe it. The U.S. National Air And Space Intelligence Center has, for decades, operated foreign-made aircraft. NASIC traces its lineage to the Foreign Data Section of the U.S. Army Signal Corps, established in 1917 as a part of the Material Division. Transferred to the U.S. Army Air Force in 1939, this small section – known as A-2 – was responsible for evaluating captured enemy aircraft, including various German Messerschmit- and Focke Wulf-designs, plus different Japanese aircraft. The first hot conflict of the Cold War – the Korean War, fought from 1950 to ’53 – clearly demonstrated that the West knew next to nothing about new Soviet weapon systems. Soviet-made MiG-15s proved capable of outperforming the best U.S. fighter of the time, the North American F-86 Sabre jet, in several regards. The reaction of the U.S. Air Force – which became an independent branch in 1948 and took over the A-2, was to expand this department into the Air Technical Intelligence Center, in 1951. ATIC operatives usually depended on foreign contacts of the Central Intelligence Agency or the U.S. military services to obtain the necessary information. It took them just a few months to acquire and analyze engine parts from shot-down MiG-15s, as well as intact and operational Yakovlev Yak-9 fighters and Ilyushin Il-10 attack aircraft that U.N. forces captured in Korea. A few months after the armistice that ended that conflict on Sept. 21, 1953, North Korean pilot No Kum-sok defected to South Korea with his plane, and the ATIC thus obtained its first fully operational MiG-15. A mere two months later, representatives of the Yugoslav government contacted the CIA with an offer for a short-term delivery of a single Yakovlev Yak-23 jet fighter. Although a communist-ruled country, Yugoslavia of that time was under a threat of Soviet invasion and thus requested help from the USA. An agreement was quickly reached — the Yugoslavs disassembled the Yak, loaded it on board a USAF Douglas C-124 Globemaster II transport at an airfield outside Belgrade and flew it out. The Yak-23 was not as advanced as MiG-15 was, but was still highly interesting for the specialists at ATIC, who put it through its paces before quietly returning it to Belgrade a few months later. The importance of the ATIC’s work grew over the following years. In 1961 it was re-organized as the Foreign Technology Division, and its assessments went straight to the National Security Council, which advises the U.S. president. Two years later, FTD obtained a copy of the flight manual for the then brand-new Soviet MiG-21F-13 fighter and translated it into English. This happened after the pro-communist government in Iraq was overthrown in a military coup, and the new government not only sought a rapprochement with the West, but also sent a group of its pilots to staff training in the USA. In 1968, the FTD got the opportunity to study an Iraqi MiG-21F-13 and two ex-Syrian MiG-17Fs that the Israelis exchanged for a few of U.S.-made F-4 Phantom IIs. Meanwhile, USAF pilots regularly deployed abroad to test-fly Soviet-made aircraft operated by the Cambodian and Indonesian air forces, among others – always on behalf of the FTD. When the latter requested deliveries of North American P-51 Mustangs in the early 1970s, the idea was born to exchange these for a full squadron of MiG-21F-13s, which the Indonesians couldn’t operate for lack of spares. Similarly, on Jan. 19, 1973, a disgruntled Soviet pilot who had flown his L-29 training jet to Iran provided a host of intelligence about aircraft and other Soviet weapons to the FTD, and thus to the USAF. In the 1970s, the Air Force began insisting on more realistic training for its pilots. The flying branch wanted to include in the training actual aircraft used by potential enemies. The FTD seized the opportunity, in 1979, to analyze MiG-21MFs, MiG-23s and different Soviet guided weapons that Egypt provided to the United States in exchange for 35 F-4 Phantom IIs. In subsequent years, FTD supported the work of the famous 4477th Test and Evaluation Squadron — the Red Eagles — equipped with ex-Indonesian MiG-21F-13s, a mix of ex-Egyptian and ex-Libyan MiG-23MSs and, later, a mix of Chinese-manufactured MiG-17s and MiG-21s. 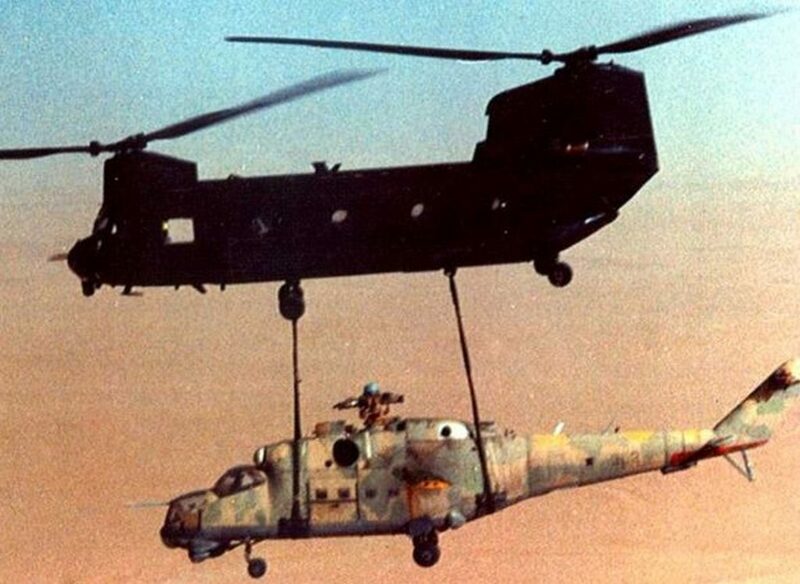 In 1988, the FTD got the chance to inspect a Libyan Mi-25 helicopter gunship that had been captured intact in Chad and which the U.S. Army extracted from the country. In 1993, the division expanded and re-organized as the National Air Intelligence Center. The ’90s were a true intelligence bonanza for the Americans. U.S. pilots had opportunities to pilot all types of Soviet-made combat aircraft operated by different air forces around the world that, with the end of the Cold War, became U.S. allies. In addition to two MiG-29s recovered from Iraq in 1991, NAIC received some of the 14 operational MiG-29Cs and 500 R-27 and R-73 air-to-air missiles that Washington purchased from Moldova in 1997. With so much Soviet-made equipment on its hands, NAIC could even deliberately destroy some of it in order to establish its exact physical limits. Since 2003, NAIC has expanded into the NASIC. Flying old MiG-21s and MiG-23 is no longer sufficient. Nothing beats the knowledge obtained from actually flying advanced jets of the third and fourth generations, such as the MiG-29 or Su-27. Requirements for the realistic simulation of enemy air forces have expanded to the degree where the U.S. Navy, Air Force and Marines are not only flying U.S.-made aircraft for so called “dissimilar air combat training,” but also hiring private companies such as ATAC to fly foreign aircraft and simulate opponents during exercises. Still, the latest Russian-made aircraft remain difficult to come by for the U.S. armed services. NASIC obtained at least two Su-27s from an unknown source more than 10 years ago. One of them has been spotted undergoing testing alongside American fighters. Rumor has it the type is operated by the 53rd Test and Evaluation Group’s Detachment 3. Flying military aircraft obtained well outside official channels is extremely dangerous. Their technical documentation is nearly always missing, there are often errors in the translation of flight manuals, spares are frequently unavailable and uncertainty abounds regarding the functionality of their systems. Even the most minor mistake can be dead;y. This is why only the best pilots are assigned to such duties. Considering his excellent qualifications and stellar reputation, Schulz was a perfect candidate for exactly such a job.